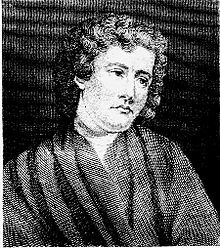 On this date in 1759, Eugene Aram was hanged at York for murder. Aram was the son of a gardener, but taught himself Latin and Greek and made himself a respected schoolteacher. Aram had a special gift for languages, and began research on a never-completed comparative lexicology of the Celtic tongue — correctly intuiting, if not the identity of the distant common mother tongue, the concept of what is now understood as the common progenitor of the related Indo-European languages. In 1745, when Aram was already 40 and teaching in Knaresborough, a strange event occurred: a friend of Aram’s named Daniel Clark made the rounds of local merchants “buying” (on credit) a variety of portable valuables … and then promptly disappeared. Aram was suspected of some part in this sketchy affair and detained using the expedient of an outstanding debt pending investigation that would yield a more satisfactory charge. Aram, however, paid off his arrears in cash. Since no real grounds existed to hold him, he walked away, and immediately left Knaresborough. There the matter rested for 13 years, time that Aram spent immersed in his language work. Justice delayed was not to be denied, however. Finally, in 1758, the accidental discovery of a body in Knaresborough rekindled interest in the case (even though the body turned out not to be Clark’s). Thirteen years on, the matter unlocked with amazing ease; Aram’s wife (left behind in Knaresborough when our man blew town) had her suspicions, which led to a mutual friend of Aram’s and the victim, who gave authorities the correct location of Clark’s theretofore undiscovered body. (Namely, St. Robert’s cave.) Upon that considerable credibility the mutual friend (Houseman by name) accused Aram of the murder. Since the wife was also prepared to swear she had heard all these men, and Clark among them, conspiring shadily together, Aram was in the stew. As a proper Enlightenment man, learner of languages, inquirer of science, writer of poetry, and author of dark and vengeful deeds, Aram didn’t bother with a barrister but defended himself, and very ably in the judgment of his observers. “His defense was an ingenious plea of the general fallibility of circumstantial evidence,” records this encyclopedia. But he had to stick to generalities because (as he admitted after conviction) he was actually quite guilty, and Aram “seemed really more carried away by the abstract philosophy of his argument, than impressed by the terrible relation it bore to his fate.” The lengthy Newgate calendar entry on his case preserves some of these sorties. He would eventually ascribe his own motive not to greed of gold but suspicion of cuckoldry. Houseman, who was probably just as involved (and probably in his part for greed) appears to have escaped the noose. Aram became a potent literary reference for his countrymen as a partially sympathetic, Janus-faced creature: the thoughtful scholar encumbered by his guilty conscience, or one whose potential gift to all mankind is undone by his injury to one man. Edward Bulwer-Lytton wrote a novel about Aram. In Thomas Hood‘s poem “The Dream of Eugene Aram”, the titular killer is tormented by the recollection of what he has done. Like Cranmer‘s at the stake. Huge drops upon his brow. Wodehouse, Orwell, W.G. Wills all also dropped Eugene Aram literary references in their day. * The town in Norfolk where Aram was hanging his hat when he was finally arrested.